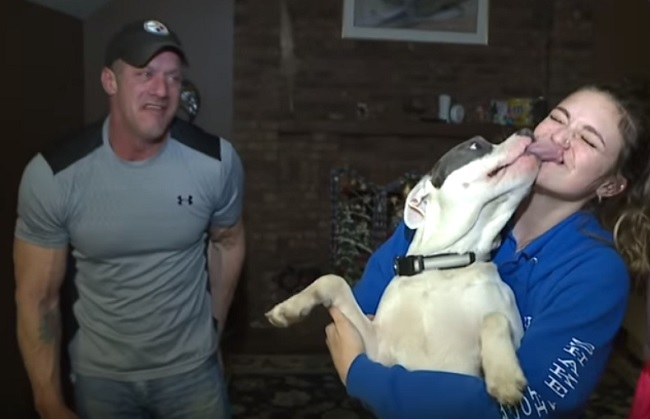 Peanut may only be six months old, but already this Pit Bull puppy from North Royalton, Ohio, is being hailed as a life-saving hero for detecting a gas leak. He was barking all night long on March 22 at what his dog dad, Brian Maloney, assumed was the family’s cat. As Peanut’s barks grew more persistent, Maloney decided he’d better go downstairs and check it out. “I got up and as soon as I came out of the bedroom, I got hit with a real strong odor of natural gas,” he told Fox 8 News. He found the source of the gas leak: his hissing stove. One of the burners had been turned on, but not enough to ignite it. Along with Peanut and the cat, the Maloney family owns two other dogs, another cat, chickens, ducks, horses and swans. They believe one of the cats may have jumped on the stove and accidentally turned the burner knob. Maloney said they’ll be taking the knobs off from now on. And of all those pets, he added, Peanut is now the family favorite. “Thank God for Peanut,” Maloney said.